For those of you staying to "art", we are putting together a short and sweet list of the events we would have attended if we were in town. We're literally posting from the road using a cell phone so we appreciate your patience as we wait to put that together properly on a computer this afternoon. Check back tomorrow morning (and throughout the week) for the scoop. Happy Basel and may the odds be ever in your favor! 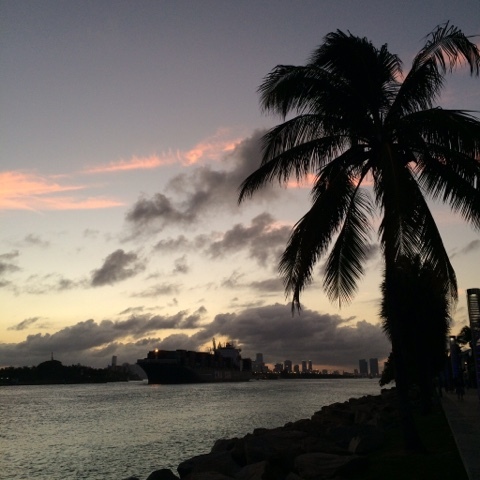 Art Basel is the raison d'être for the week so you must visit at least once during the week. Before you go, get the low-down on all the galleries on Artsy's Art Basel 2015 Miami page to make the most of your visit. The new Artsy iPhone app is another great alternative as it includes a personalized visitor's guide. All week COYO Taco has a sick music line-up in their speakeasy-style lounge. Entry is free, on a first come first serve basis. Another alternative for joint music and art lovers is Superfine! House of Art and Design in Little Haiti. The "Arty Party of the Year" runs from Wednesday through Saturday with a great roster of artists including Baio of Vampire Weekend, Shamir, Afrobeta, and more for $25 or less, or you can get an all access pass for $65. The SLS South Beach has transformed into a living art display for the week featuring a series of installations throughout the hotel featuring artists like Laura Kimpton, Andy Warhol, and J. Open HeART. Poolside, the hotel will be hosting pop-up shops featuring art, clothing, accessories, etc. from Gretel Home, Jewels by Dunn, and Laura Kimpton. GLAMSQUAD unveiled a limited edition "Off Duty" hairstyle to help you look effortlessly cool all week. Book this look for only $50 plus tax and tip or other mobile beauty services via GLAMSQUAD.com and the GLAMSQUAD app. World-renowned Spanish artist Antonio Dominguez de Haro, known for his unique depictions of the deep sea, arrives in Miami to showcase his work in the U.S. for the first time in 30 years. The week-long exhibition at the Four Seasons Hotel Miami is open to the public. On Wednesday, GEN ART, Flaunt Magazine and Dawn of Man will host a sunset party from 7 p.m. to 10 p.m. at the Mondrian South Beach featuring live painting by London-based artist William Mackrell. Thursday through Sunday, Brickell cabaret hotspot El Tucán will host two exclusive performances a night by critically acclaimed Cuban actress and singer, Cucu Diamantes. The first show of the night begins at 9 p.m. and the second show begins at 11:30 p.m. For ticket pricing and information, please visit the El Tucán event page. Friday at 5 p.m. Project Beauty will launch its female empowerment campaign in collaboration with Miami urban artist Diana "Didi" Contreras (you may remember her from the "A Blank Canvas" event at the A+E District) at Gallery 212. On Sunday, the A+E District will host its third edition of their super popular Miami Flea from 2 p.m. to 6 p.m. This event is free and open to the public with RSVP. Post-Basel recover in Key West at one of The Marker Waterfront Resort's serene guest rooms. Their special Art Basel two-night stay package (available for booking from December 4 through December 13) includes a selection of in-room spa amenities such as soaking tubs with a key lime salt scrub and marine mud mask, as well as a specially-curated Art Lover's Key West Gallery Guide for only $399. For those of your looking for a moment of "Bliss at Basel", the Eden Roc Miami Beach is hosting a series of health and wellness events throughout the week for only $20 a class. On Friday from 5 p.m. to 7p.m., the fragrance experts at Babalú's Lincoln Road store invite you to Olfactive Studio: Parfums Inspirés, an event celebrating contemporary art photography-inspired fragrance collection from Paris. On Saturday, OMG Miami Swimwear will make its storefront debut at 815 Washington Avenue with a celebration from 7 p.m. to 10 p.m. This can't miss event will feature body art, a gallery showcasing local artists Monica Silva and Adriane Leigh, a burlesque performance, a fashion show of OMG Miami Swimwear's covetable designs, and complimentary cocktails and sushi by Planet Sushi. If you're looking for more social calendar inspo, check out the amazing Art Basel 2015 event guide our friends at Racked Miami put together and the local's guide to Art Basel our friends at The New Tropic released earlier this week.